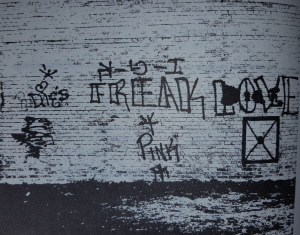 From a 1980s Chicago Police manual, this is an impressive one simply for the strategic placement of the tag, it shows the dominance of the Freaks in this neighborhood by putting this in big letters on top of an overpass. The Freak’s story dates back to the year 1967 at a time when the Vietnam War was raging on and many young men and women protested the war by forming hippie groups. Hippies often called themselves “freaks” because they felt like outcasts and different. One such group of hippies that called themselves freaks was a group that hung out in Kelvyn Park at Kilbourn and Wrightwood in the Hermosa neighborhood. These guys and girls loved to drink beer smoke pot and drop acid like most hippie groups did back then. Within a few years Puerto Rican gangs began moving in near the Hermosa neighborhood and gang violence was flaring up in Humboldt Park, Austin, Logan Square and even some in Belmont-Cragin. One major gang that was becoming a problem were the Latin Kings that wanted to take over Humboldt Park and Logan Square but to the hippie group in Kelvyn Park the Latin Kings were dealers that had really good pot and acid and some of the Kings loved to get wasted with this hippie group so these hippies started hanging out with Latin Kings. As the friendship with the Kings grew it became noticed by the enemies of the Latin Kings the Spanish Cobras and the Imperial Gangsters which then led this hippie group into conflict with these two gangs. These hippies of Kelvyn Park were not your typical wimpy hippies they were fighters, warriors and did not take it from Spanish Cobras and Imperial Gangsters. The Young Blood Freaks now had colors of black and light blue and wore gang sweaters. Within no time the Freaks expanded all around the Hermosa neighborhood as they fought against the Puerto Rican invasion. Diversey and Kilbourn (DK / No Mercy on Diversey), Keeler and Armitage, Keeler and Palmer, Kilbourn and Fullerton Avenue, Kilbourn and Montana, Wellington and Kenosha (Ken-Wel Park) and Kilbourn and Wrightwood (Kelvyn Park) all became Young Blood Freak turfs. 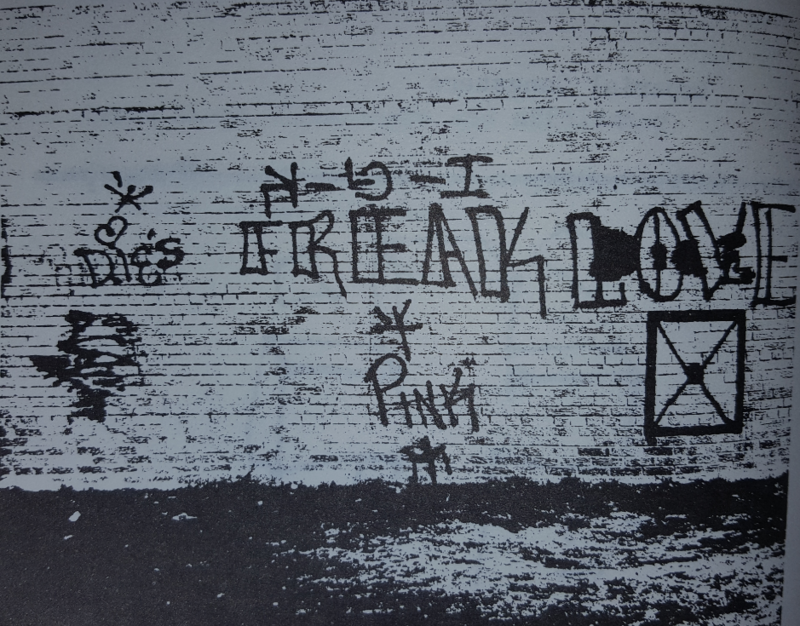 The United Freaks could be found on Irving Park Road and Central Ave, Lamon and Cullom and Montrose and Cicero Ave. The Insane Freaks of Jefferson Park could be found at Milwaukee Ave and Austin Ave they were also in Norwood Park at Peterson and Nagle. Norwood Park never had strong gang activity and the Freaks there were simply in the area to keep other rivals from moving in. 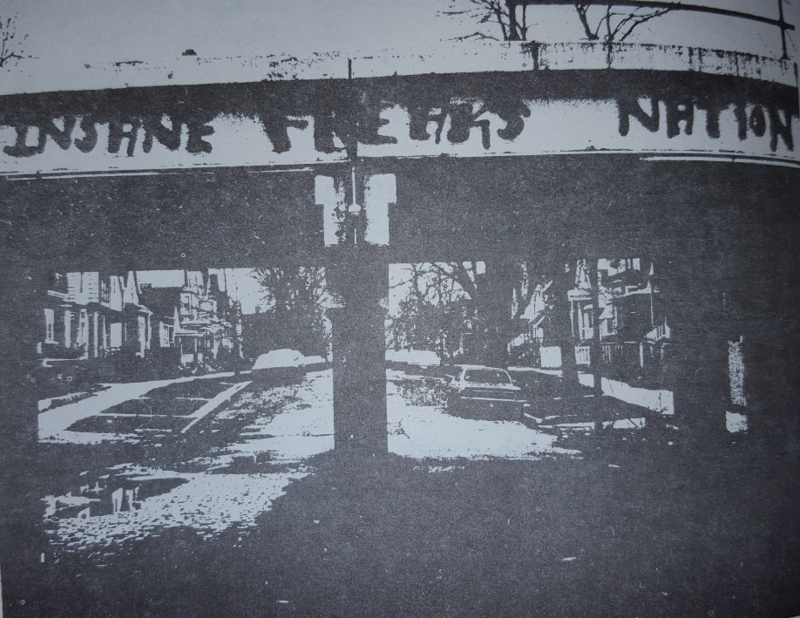 Jefferson Park was another all-white neighborhood that had issues with gang activity among white gangs this was the same issue with Portage Park. The toughest fought streets were in Hermosa fought by the Young Blood Freaks. In the late 1970s the Young Blood Freaks were fighting a bloody battle with the Spanish Cobras for control of Kelvyn Park, but the Cobras were growing in number because the neighborhood was becoming more Latino than ever and white flight was running its course. The Young Blood Freaks then met with Insane Freaks and United Freaks and they all became one “Freak” gang. The Freaks were wanted heavily by the UFO alliance but the Freaks never officially joined. In the early and mid-1980s the Freaks fought viciously for Kelvyn Park against the Spanish Cobras and fought the Latin Eagles tooth and nail in the southern part of Hermosa. By 1982 the UFO had completely dissolved so the Freaks no longer had the backup from that alliance; however, Freaks still had backup from Gaylords, Playboys and Jousters. The Freaks were also still heavily allied with Latin Kings and also had a good unity with the Insane Deuces. A new war started with the C-Notes after UFO dissolved. I want to clear up a bit of false info that has spread around the internet about the leader known as “Crazy F.” Crazy F did not start the Freaks organization because Crazy F was only a baby when the first Freak gang formed in Hermosa and there is a bad story saying he led the Freaks to become a criminal organization in the late 1970s, ha! In the late 1970s Crazy F was 11-13 years old during those years which is probably the time when he just joined the gang and was only a pee wee member. Crazy F did not assume leadership until later into the 1980s. In 1987 Crazy F shot a Spanish Cobra gang member because the Cobras had shot at him and his wife and also firebombed Crazy F’s home before the shooting happened. Crazy F was originally charged with attempted murder but got the charges dropped down but still found himself behind bars in 1991. 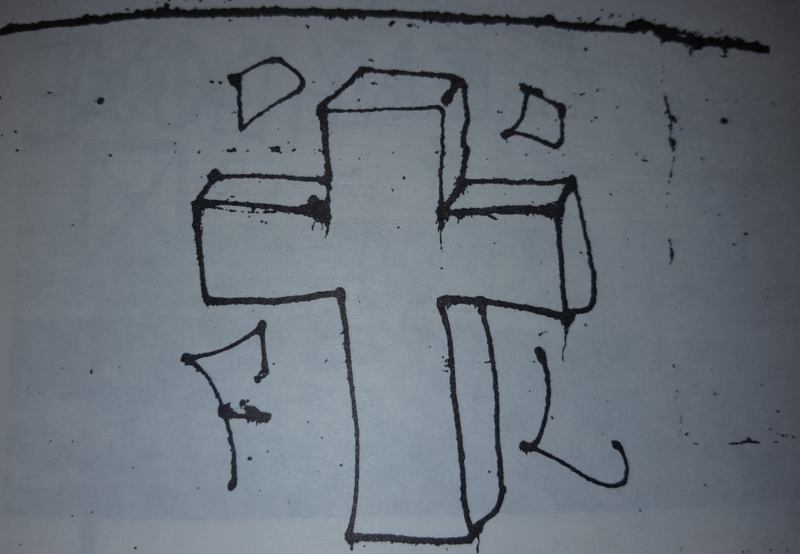 Once Crazy F was behind bars he found himself outnumbered by gangs of the Folk Nation and People Nation gangs would not help him, not even Latin Kings because Freaks were not People or Folks. 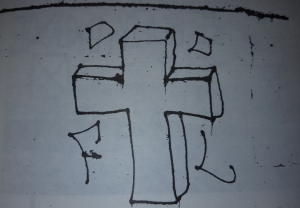 Crazy F then got connected with the Latin Counts and brought the Freaks into the People Nation under the wing of the Counts and Black P Stones. Both Latin Counts and Black P Stones wear the colors of black and red; therefore, the Freaks adopted these new colors, the Freaks also showed their loyalty to the Stones by adopting “Stone” into their name, thus, becoming the “Stone Freaks” or more preferably known as the “Stoned Freaks” because “Stoned” taps more into their roots as partiers that like to get stoned. The Freaks also adopted the first name of “Almighty” which is used by all People Nation gangs. Joining the People Nation did not save the Freaks from losing Kelvyn Park or any of their other Hermosa sets, the Freaks had to fully withdraw from that neighborhood because it was over 90% Latino. The Freaks then opened a new section in the Edgewater neighborhood at Clark Street and Hollywood and another section at Belmont Avenue and Central Avenue in the Belmont-Cragin/Portage Park border. In the 1990s the Freaks faced many problems with the police in the Portage Park, Edgewater and Jefferson Park neighborhoods and by the late 1990s all these sections closed down. The Freaks then moved into the suburb of Fox Lake where it is said they are still active or at least were up to a few years ago. There have also been older more retired gang members around Belmont and Central. Crazy F retired from gang activity and moved to Skokie; however, old rivalries may have caught up to him because he was found dead in a burning car on October 8, 2016. The Stoned Freaks were a very tough gang of stone greasers that left a legacy, they went extinct because they could not fit in with the 21st century gang banging. The Freaks were also not big drug dealers although they did operate a Heroin and PCP business for a while. What exact year did the Freaks of Jefferson Park form? Where they indeed called Insane Freaks? What exact year did United Freaks form? Who was the founder of the Young Blood Freaks and what happened to him? Who was the founder of the Jefferson Park Freaks and what happened to him? Who was the founder of the United Freaks and what happened to him? Who were the rivals of United Freaks and Insane Freaks before they united with Young Blood Freaks? What exact year did Young Bloods, United Freaks and Insane Freaks come together as one gang? What is the time line of leaders of all Freak organizations? What year did each street corner open and what year did each close down?